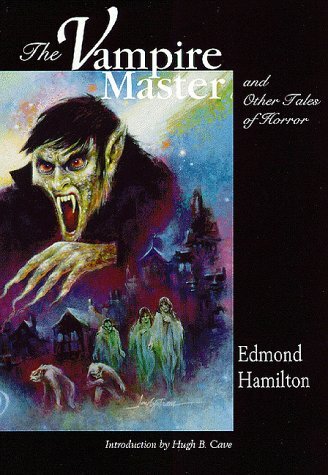 While primarily known for his adventures of terrestrial doom and interstellar peril, Edmond Hamilton also wrote a number of tales of mystery and horror. The Vampire Master and Other Tales of Horror collects nine stories from pulp magazines such as Strange Tales of Mystery and Terror, Thrilling Mystery, and Weird Tales. Included are Hamilton’s four tales of supernatural terror that appeared in Weird Tales under the nom de plume Hugh Davidson. Two of these stories feature the psychic detective, Dr. John Dale. An introduction by Hugh B. Cave, recipient of the World Fantasy Award for Lifetime Achievement, provides a personal glimpse at the bygone days of writing for the pulp magazines. Included as an afterword is an essay by Hamilton reflecting on the halcyon days of writing for Weird Tales. As befits the rationalistic side of Hamilton, these tales are all rather straightforward almost to the point of bluntness. No Lovecraftian atmospherics here, no ornate Clark Ashton Smith language. In this fashion, Hamilton can be seen as a forerunner of a kind of streamlined Horror that was to burgeon during the second half of the 20th century. Nonetheless, a crisply arranged tale like “Dead Legs”—in which a mobster engineers a horrifying transplant that backfires—still conveys its full share of grim and gruesome thrills. The titular novel, a little slow to get going, finally takes off in a macabre spectacle of beheadings and stakings. A linked story, “The House of the Evil Eye,” featuring the same protagonist, psychic detective Dr. John Dale, is more compact, but less eerie. And even the rationalized tales like “The Earth Dwellers” and “Beasts That Once Were Men” sustain their shocks without supernatural intervention. "If I may be pardoned for presuming to comment before I have read all of it, ‘The Vampire Master’ is deftly done, its treatment of the vampire material unusual, showing the operation of a mind more strongly logical than is usual in writers of the supernatural." "A primal shaman spinning fables of fear, fantasy, and science in a time before genres were rigidly defined, Edmond Hamilton crafted tales of cosmic space voyages and harried descents into inner-space with intelligence and enthusiasm . . . Hamilton’s ideas were as cosmic as his style was intimate. Keen observation and concise imagery lend his stories believability . . . "Snake Man,” a masterful exercise in suspense, is a ‘how to’ manual of how to use the senses to evoke emotion. As our hero, an eccentric snake hunter in the Florida swamps, tracks the monstrous reptile who leaves behind chillingly wide tracks, we’re brought alongside him as a result of Hamilton drowning us in sensory overload, depicting the sights, sounds, feel, and taste of the humid air, the slime, the palpable feeling of dread closing in . . . The collection is an admirable introduction to a skillful if unpretentious storyteller whose direct approach to fear and thrills are well suited to his brisk sentence structure and assessable language. Good, scary fun!